“I know that history at all times draws / strangest consequence from remotest cause” says Thomas Becket in T.S.Eliot’s Murder in the Cathedral. And though the phrase has been quoted often enough to become a cliché, that doesn’t make it a whit less true. Where we arrive at in history is the result of a complex chain of actions and decisions that were meant to drive us in quite a different direction. We are always wrong about where we think we are going in history. Decisions made and actions taken now will have consequences that we cannot remotely foresee. They will make a world quite disconnected from any intentionality. Brad S.Gregory’s The Unintended Reformation is a long, scholarly and very demanding illustration of this thesis. Its 400 large and closely-printed pages of text are followed by nearly 200 pages of end-notes and index. 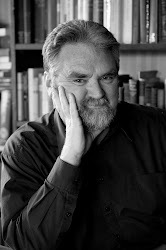 Gregory is a Professor of Early Modern History at Indiana’s Notre Dame University and his book has been published by Harvard University Press. This is not light popularisation, yet its theme is quite simply stated. Five hundred years ago, argues Gregory, Protestant Reformers believed they were reviving an authentic Christianity, which was being stifled by a corrupt and superstition-laden Catholic church. They believed their revolution would make Europe more authentically Christian. Instead of making Europe and Western civilization more Christian, however, their efforts inadvertently secularised society and created the conditions for a consumer-driven capitalism in which religion is privatised and marginalised. After an initial period of fiercely partisan zealotry, the Protestant Reformation made the West less Christian. Notre Dame is a Catholic institution and the odd reference in The Unintended Reformation suggests to me that Gregory is a Catholic. However, this is in no sense a partisan work. When he discusses the Reformation, Gregory includes contemporary Catholic attitudes thereto and sees them as part of the problem. He is not fantasising about “a world we have lost” and his Conclusion is called “Against Nostalgia”, making the obvious point that, however much we may regret a corporate, public and generally-accepted system of belief and morality, it is not coming back any time soon. (And for the record, this book was awarded a scholar’s prize by Indiana’s Wesleyan University – not a noticeably Catholic institution.). Each of the book’s six long chapters begins with a reflection on the present and asks how it came about. Each then goes back to intellectual and social conditions in the later Middle Ages and follows their consequences through to the present. 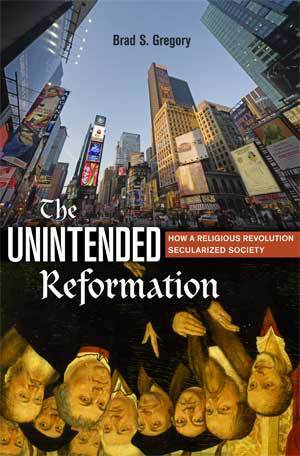 At least in part, The Unintended Reformation is a protest against current periodization employed by most historians; and their notion that the modern world can be explained solely with reference to the “Early Modern” world and Enlightenment, while everything before that is relegated to irrelevance. Further, Gregory is concerned to interrogate the pervasive use of “we” by socio-historians when they refer to the present and assume that a secular, non-religious view is now normative and uncontested. In reality, “we”, if used honestly, would have to include a hyperplurality of world-views including many directly related to the religious past. The opening chapter “Excluding God” sees the origin of a major philosophical problem in the late medieval adoption of Duns Scotus’ conception of God not as being itself (esse) but as a being (ens). “If real”, says Gregory, “a transcendent God is not subject to empirical discovery or proof.” But when Scotus’ conception of God was backed by William of Occam’s univocalism, God was sidelined and became just another aspect of nature – a being greater than other beings, but still a being. Gradually God was squeezed out of discourse concerning nature even though, as Gregory observes, there is absolutely no way that the modern natural sciences have in any sense “disproved” God’s existence. Further, the God rejected by “science” is not the Christian God. However, intellectual diversity in the Middle Ages was largely anchored on teleological, Aristotelean-Thomist assumptions and more was shared than was contested in intellectual life. In his second chapter “Relativizing Doctrine”, Gregory argues that this framework was stripped away and teachings became so diverse as to be mutually-exclusive. Protestant reformers attempted to attack a corrupt church by attacking what they saw as an accretion of non-biblical traditions, because in one form or another they believed in the concept of sola scriptura – the concept that a purer Christian doctrine would emerge if the Bible alone were referenced and non-scriptural traditions and canon law jettisoned. But it was soon evident that scripture, despite a frequent and erroneous claim, was not and is not “self-interpreting”. Among Protestants, cutting loose from tradition and in most cases from church councils meant strong disagreement on essential doctrines. The short-term solutions were various confessional formulations and local enforcement of these using the power of the state. Another solution was to lean on the Holy Ghost as arbiter – God would directly reveal the truth of scripture. So we go down the Pentecostal path, or come to the “inner light” of Quakerism. But none of these resolve the multiple doctrinal differences between Protestants (let alone between Protestants and Catholics); and opportunity is given to the sceptic claim that therefore all confessional truth claims are wrong. This leads ineluctably to the more recent superstition that reason alone with tell us moral and intellectual truths. But this proves to be as much of a chimera as sola scriptura, creating a world in which there is no objective moral or intellectual truth, but only opinion based on personal preference. In his third chapter “Controlling the Churches”, Gregory notes that despite co- existing with many different polities, the Catholic Church was never absorbed by or coterminous with a given state. Also the doctrine of ex opere operato taught that the workings of grace and the efficacy of sacraments never relied on the personal holiness of those administering them. But emphasising individual “godliness” in its ministers, and having broken with church traditions, Protestantism could survive only by leaning on the coercive arm of the state. At this point, Gregory distinguishes between “magisterial Protestants” and “radical Protestants”. By “magisterial Protestants”, he means those able to create confessional states with the help of political patrons – Luther in Germany, Calvin in Geneva, the Church of England etc. By “radical Protestants” he means those who gained no such political support. The doctrinal problems of magisterial Protestants were apparently “solved” only because they had the secular political power to impose a local orthodoxy, and stamp out alternatives. To put it more simply, the “success” of Protestantism was not the victory of a purified doctrine, but of a secular power to enforce highly-contested doctrines. Please note that in this analysis, Gregory says the same was true of Catholic countries as they regrouped and reacted to the Protestant Reformation. Philip II’s Spain was as much a confessional state, with orthodoxy enforced by the royal government, as Elizabeth I’s England was. But Catholic doctrine was not engendered by the state or its appointees, as the doctrine of magisterial Protestant countries was. The essentially Erastian relationship between church and state in magisterial Protestant countries set the pattern for a secular control that would gradually compartmentalise and minimalise the role of religion in life. But the individualisation and privatisation of belief in the Reformation led to the idea of personal merit unconnected with the greater social good. Hence, in societies where religion was privatised, the greater pursuit of individual profit became first acceptable, then the norm, as religion’s restraining caveats were also privatised. In chronicling all this, and especially in his analysis of early mercantile Holland, Gregory is not merely restating Max Weber’s famous century-old thesis on the connection between Protestantism and capitalism. Certainly there’s a Weberian tone to his account of Calvinism seeing the individual soul as depraved, seeking signs of God’s favour and “election”, and ultimately finding them in personal wealth. But Gregory is always aware, as Weber wasn’t, that rise of a consumer capitalism was an unintended outcome of the Protestant reformation – not intrinsic to it. For all that, he can trace a direct line from the privatised, individualised morality of the Erastian Protestant state to “shopping therapy” in the mall. The book’s last chapter “Secularizing Knowledge” essentially restates some of the intellectual themes of the opening chapter– the journey from universities built around a shared Thomist-Aristotelean base to confessional Protestant states first privileging Bible studies in universities and then becoming secularised so that eventually theology was banished from the academies. Despite the different materials of each chapter, there is a common theme. Privatised Biblical interpretation led to privatised religion, which in turn led to privatised morality, unconnected to corporate belief, Christian tradition or shared values. The disconnected individual became the centre of the universe and therefore the prime value became self-interest (whether spiritual or material). From this grew not only consumer capitalism, but also secular liberalism, which emphasises individual rights, but which, in and of itself, has nothing to say about the corporate good of the community as a whole. None of this was foreseen by Protestant Reformers and certainly none of this was intended, but it was the clearest long-term outcome of their efforts. To claim that Protestantism revivified Christianity, one would have to arbitrarily stop the clock at the relatively early point where reformers were attacking the many, gross and obvious abuses of the Catholic Church. But beyond that early phase, the Protestant Reformation did not work to perpetuate the Christian community. How do I criticise this as a book? Of course, like all books which argue a case, it is in part a polemic, but it is a well-researched one and the case it makes is a good one. In future, those who disagree strongly with its conclusions will still have to grapple with its argument. In that sense it is bound to be seminal. I do sometimes regret the author’s style. He can allow sentences to run on too long in too many subordinate clauses. But he can also makes points forcefully and pithily, as I hope the short passages quoted in this over-long notice prove. It is odd how some prominent writers and thinkers are better remembered for events in their life than for anything in their written work. For much of his lifetime, the Basque-born Miguel de Unamuno (1864-1936) was regarded as Spain’s greatest philosopher. I do not speak Spanish and am no expert in Spanish writing and philosophy, so I do not know what Unamuno’s reputation is in Spanish-speaking countries now. But I do know that in English-speaking countries, and thanks to nearly every detailed history of the Spanish Civil War, he is best remembered for the circumstances of his death. A sceptic, but of an essentially conservative temperament, Unamuno agreed with many of the Right’s criticisms of the Spanish Republic (1931-36) and feared the growing influence of the extreme Left. At first he welcomed the Franco revolt. But he was quickly shocked by the violence and extreme rhetoric employed by Francoists. Aged 72 in 1936, he was rector of the University of Salamanca. When the Nationalist forces took over the city, they expected Unamuno to preside at a victory celebration at the university. Instead, and in the face of angry and armed men, Unamuno gave a famous speech in which he denounced the Francoists’ hostility to Spain’s ethnic minorities (especially Basques) and the brutality of their programme. Only his international reputation saved him from being shot on the spot. He was escorted from the hall under the protection of Franco’s wife and was placed in virtual house arrest, where he died (most sources say “broken hearted”) ten weeks later. Being remembered for this final show of heroism, Unamuno is regarded as an intellectual martyr in the face of Fascism. Those on the Left who have never looked into the matter might even believe he was some sort of “progressive”. So it will be surprising for some to discover that his most famous single work of philosophy The Tragic Sense of Life (Del Sentimiento Tragico de la Vida), written before the First World War, when he was in his late forties, is essentially an emotional defence of a conservative concept. I read its 300-odd pages in a 1961 Collins “Fontana Library” paperback reprint of what is, I believe, the standard English translation (by J.E.Crawford Fitch). I give page references according to this translation. Man’s deepest awareness is of the brevity of life and the inevitability of death. Therefore man’s deepest desire is for immortality, which is essentially a rebellion against the fact of death. This desire for immortality drives the greatest creative faculties in human beings. It is the desire for immortality that fires the imagination, makes people create great works of art and fuels our most intense sensual experiences. Immortality means the survival after death of the individual ego, consciousness and feeling. Unamuno will accept no substitutes for this concept, and waves away such ambivalent notions as pantheism or some sort of absorption into God after death. To defy death is to be most fully alive. To create anything of worth is to protest against death. Only the existence of God can guarantee immortality. Therefore belief in the existence of God is necessary for a fully creative life. Whether God actually exists or not is beside the point. It is the belief in God’s existence that matters, even if God, in objective fact, is merely a product of the human imagination. Attempts to prove or disprove the existence of God are irrelevant to this creative necessity to believe in God, which is intrinsic to the human species. (God is absolutely essential to the world-view of any atheist.) It is also irrelevant whether God is Saviour or Redeemer. All that matters is the fact of the concept of God as Guarantor of life beyond death. In Chapter Seven, Unamuno argues that love is the desire to perpetuate. Suffering centres on our finiteness. Pity is love extended to our fellow human beings. We are unconnected to the universe if the universe does not have personality. Therefore consciousness must be at the centre of the universe. This is God. At once it can be seen that, as a philosophy, Unamuno’s thesis is deeply offensive to both believer and non-believer. To the believer, Unamuno reduces metaphysics to mere aesthetics and he is just another symptom of the decay of belief. A God who is only imagined is no basis for ethics, piety and goodness. Unamuno’s philosophy is an invitation to religious formalism bereft of belief, and to that tribe of agnostic idiots who go to church because they like the music and the aesthetic traditions but have no time for the message. (And, inevitably, I find that once upon a time this book was placed on the Catholic Church’s Index of Forbidden Books). To both believer and non-believer, the existence or non-existence of God is a matter of vital importance and cannot be shuffled aside as a secondary issue. To both believer and non-believer, Unamuno is a successor to the aesthetes, whose religion was organised sensual experience (look up Walter Pater or Marius the Epicurean on the index at right). He is equally a precursor of the mid-20th century atheist Existentialists, who enthroned the ego and asked people to assert themselves by “choosing” in order to render life coherent and to annul the “absurd”, regardless of whether their “choice” pertained to any objective reality. It seems no accident to me that The Tragic Sense of Life (as well as being full of references to now-forgotten early 20th century academic works of theology and philosophy) is peppered with quotations from Pascal and Kierkegaard, the two major Christian thinkers who come closest to an Existential basis for their belief. The book’s “Conclusion” is entitled “Don Quixote in the Contemporary European Tragi-Comedy”. Imaginative reaction against banal materialism; rationalism (in the true philosophic sense) rather than empiricism; a tendency to walk on the dangerous edge of life and death, and to laud people who live by extremes (hello machismo) - all these things seem, to the uninformed non-Spaniard like myself, very much in the Spanish grain. So Unamuno’s most comprehensive philosophical statement can be picked apart. Yet here is a paradox that will be known to any real student: even a deeply flawed philosophy can be very nourishing. And, in its many imaginative insights, The Tragic Sense of Life is a very nourishing book. One of its most attractive features is Unamuno’s awareness that a valid philosophy has to take cognizance of the whole human being, not just of the (important – but limited) faculties of logic and reason. Throughout The Tragic Sense of Life he insists that philosophy springs from the personalities of philosophers; and the human consciousness is the centre of our reality. As you can see, I find it very easy to quote wise things Unamuno said, even if I find his philosophy flawed. That is because I read his book as a species of imaginative literature which in a sense (and as Unamuno himself argues) is what all philosophy is, even that which imagines it is most “objective” and scientific. I am particularly intrigued by his love-hate relationship with Catholicism. Unamuno affirms the felt and instinctive version of Catholicism as most satisfying our immortal craving, but he accuses the church of substituting rationalism for faith. Thus he is as much the enemy of Aquinas and of Thomism as he is of Voltaire and his heirs. Then there is his Chapter Ten, entitled “Religion, the Mythology of the Beyond and the Apocatastasis”. Logically and correctly, Unamuno lists positivist and rationalist philosophies under the heading of mythology, they too being purely imaginative attempts at explaining central realities. Perfectly true. Heaven is seen as a place of boredom. Unamuno’s imaginative counter to this popular feeling is his suggestion that eternity could be the joy of endless discovery and development. As in this whole book, his endeavour is to preserve the uniqueness and vitality of the individual consciousness beyond this life. You can use your own imagination to accept or reject this. This could easily become grumpy-old-man territory. The Druid complaining that writing damages the memory and all things should be held in the brain. The writers about whom Colette complained in the 1920s, who said that too much (silent) cinema damaged the imaginations of children who watched it. The fears of any new medium, which some old codger is likely to express. Throw away your Kindles and read real books, you Philistines! Anyone who expresses such sentiments is likely to be told that he/she is an anachronism and incapable of understanding the fine interplay between expression and modern technology. Yet at some stage I have to ask the questions. Do we really need to take all the snapshots we take, or record all the family celebrations we record with our phone-cameras, so that we can paste them on Facebook? Shouldn’t we sometimes let things remain unrecorded, so that they can percolate and grow in our brains? Why not let our minds decide what is a priority in our lives, rather than letting mechanical recording devices chain us to their interpretation of reality? I think of all those occasions when I have been at 21st birthday parties, or wedding anniversaries, or even wakes for the dead, and have seen a long string of photographs and images expressing every phase of the life of the beloved or the deceased or both. Believe it or not, the precursor to this line of thought came to me when I was about eleven years old, and travelling on a tour bus through Vienna. In the seat in front of us was a Japanese gentleman who had, glued to his eye, a small cine-camera. (This was in the early 1960s and years before video, let alone more recent technology, had become common currency.) At the front of the bus, the Austrian tour guide would point out some notable feature of his beloved city – a statue of Mozart or Johann Strauss; the Palace of Justice; the great cathedral with its variously-coloured roof; a gold-toned statue of a Soviet soldier which, at that time, and by a treaty obligation, the Austrians were obliged to leave standing as a memento of their occupation after the Second World War. And each time the tour guide spoke, the Japanese gentleman would swing around without once removing his eye from his view-finder, and film whatever had been pointed out. It occurred to me, even with my primitive eleven-year-old brain, that he had never once looked with his own naked eye at what had been pointed out to him. He had let his camera do the looking. His experience was by proxy (No. I am not suggesting that I had the sophistication to articulate this at the age of eleven, although I felt it.) His only “real” experience of the things he “saw” would be when he played his movie back to his family in Osaka. So, as we film with our phone-camera and paste what we photograph on Youtube, we are diminishing the power of our brain to discriminate among memories, and allowing technology to become our memory. Perhaps it would be clearer if I left what I have to say in the form of a poem which I included in my collection The Little Enemy (Steele-Roberts, 2011). The poem is called Long After It Was Heard No More. I could abase and win. that lie like the truth. and not the image’s memory.